Am I required to spend 60 hours online or in a classroom? How does Moseley’s pass rate compare to other schools? Is Moseley Real Estate Schools affiliated with Moseley-Flint schools of real estate or Moseley-Dickinson academy of real estate? What are Virginia’s requirements to become a real estate salesperson? Due to Virginia Real Estate Board regulations, students completing an online course are required to study the online course material for a minimum time-requirement, depending on individual course-credits. You can view your remaining time at the top of each individual topic presentation. You must fulfill each individual time-requirement in order to sign up for your Moseley Efinal Exam. Students in our live classes are not required to spend a minimum time-requirement in the classroom, as the live class method offers the convenience and pace of our correspondence course with the benefits of instructor-led, live classes. There is no additional cost! The Moseley final exam can be attempted as many times as necessary until you pass. Most real estate schools charge a fee every time you retake their exam. We believe that having the flexibility to take our final exam as many times as necessary is an important element in your success with passing the VA Real Estate Licensing exam the first time. Moseley’s superior first-time pass rate consistently beats our competitors’ first-time pass rate on the VA Real Estate licensing exam. Recently, Moseley’s VA licensing exam first-time pass rate was 82%, knocking out our competitors’ average first-time pass rate of only 56%, as reported by PSI. Your time and your money! Moseley has designed our course content to focus exclusively on topics tested on the VA Real Estate licensing exam. Other schools re-sell a single national textbook, leaving you to sift through irrelevant information. We take our superior “first-time” pass rate seriously and use it to evaluate the success of our course material. No. Moseley Real Estate Schools is not affiliated with Moseley-Flint or Moseley-Dickinson in any way. 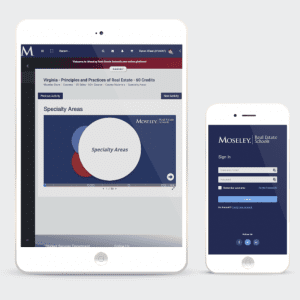 Moseley develops all of our own course content and does not share our content or educational methods with any other real estate education provider. Moseley allows students up six months to finish their courses. At other real estate schools, your tuition may expire in as little as three months, forcing you to pay full tuition again. With Moseley, your tuition remains valid for 6 months from the date of purchase with an option for tuition extension (for a minimal fee), should you require additional study time. visit the Virginia Real Estate Board. Well, we hope you never would, but Moseley is always interested in feedback. We’re ready and willing to improve our materials and systems to best fit the needs of our students. Please send all comments and suggestions to feedback@moseley.org.